Democrats have won a new majority in the state Senate, giving them full control of the Legislature and the governor’s office. That doesn’t mean progressive tax reform will necessarily be on their agenda in 2018. Throughout this year’s campaign season, Democrats were full of promises about what they could accomplish if only they gained a seat to win full control of Washington’s Legislature — from enacting new gun-control measures to rolling back a recent increase in the statewide property tax. They won. With Redmond Democrat Manka Dhingra’s election to the Senate, Democrats now control both houses. But delivering on some of those promises won’t be so easy. I have covered too many legislative sessions to think state lawmakers will summon the courage to attempt major tax overhauls in an election year. But leading up to the November election, Democratic organizers in a key battleground district thought differently, suggesting they could “lay the groundwork for progressive tax reform” if voters gave them a new, shiny majority in the state Senate. “By winning this year’s special Senate election, we can make Washington State into a haven for progressive values,” proclaimed the website for the 45th District Democrats, a local party group at the center of this year’s fight for legislative control. Democratic Gov. Jay Inslee has since pledged to renew his push for a carbon tax during the Legislature’s 60-day session that begins in January. This month, he cited Democrats’ new, one-seat Senate majority as a reason he thinks the tax might pass in 2018. 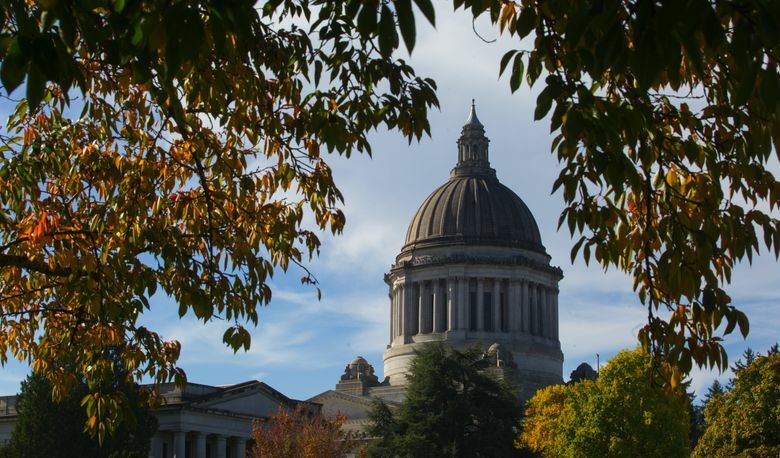 Yet even as Sen. Sharon Nelson, D-Maury Island, moves into a bigger Capitol office with her new title “majority leader” emblazoned on the door, the reality is probably not going to be a huge sea change. At least, not in 2018. To think otherwise ignores an inconvenient fact of life in Olympia: Not all Democrats at the Capitol are of the more liberal Seattle variety. Many hail from less urban parts of the state, where “progressive tax reform” sounds more like a path toward losing their next election. Sure, Dhingra’s win in the 45th District puts the Legislature narrowly in Democratic hands for the first time in five years. But with Democrats having only a 25-24 majority in the Senate and a 50-48 edge in the House, a handful of moderates will still be calling the shots, as they often have in years past. Losing even one vote in either chamber is enough to kill hopes of progressive tax reform. And, already, a trio of moderate Democratic senators — Mark Mullet of Issaquah, Steve Hobbs of Lake Stevens and Dean Takko of Longview — have said they would have difficulty voting for a tax on capital gains (such as profits from selling stocks and bonds). They also share reservations about some of the carbon tax proposals. “A lot of these hot-button issues, I don’t think you’re going to see a lot of that happen, whether it’s some kind of gun control, or a carbon tax, or some other kind of tax,” Takko said recently. He said he worries a carbon tax could hurt businesses in his Southwest Washington district, while a capital-gains tax could potentially be taken down in court by those arguing it is an unconstitutional tax on income. A fourth Democratic senator, Guy Palumbo of Maltby, wouldn’t commit to voting for a capital-gains tax, either. And, while bipartisanship is a noble aspiration, any attempt to lure Republican votes for a carbon tax or capital gains tax risks making concessions to business interests that could lose progressive Democratic votes. No one wants to take tax votes in an election year, no matter who is in charge. The only thing that might motivate state lawmakers to deviate from this universal truth next year might be fear rather than courage. Certain lawmakers, including Palumbo, are concerned that voters may go ahead and enact a carbon tax by initiative on their own. A group called the Alliance for Jobs and Clean Energy is working on a carbon-tax proposal for the November 2018 ballot, along with a coalition of Native American tribes. But in a short, 60-day session right before an election, Democrats are just as likely to leave the carbon-tax decision to voters, then come back to make changes afterward if it passes. After all, that’s how they handled legalizing weed. With all the moderates flexing their muscle at the Capitol, plus the glittering prospect of turning more legislative seats blue in the 2018 elections, some of the most ambitious tax proposals will most likely have to wait.